Khashoggi speaking in Washington, DC in March 2018. Photo: April Brady/Project on Middle East Democracy/Wikimedia Commons. Washington Post Publisher and CEO Fred Ryan made the following statement concerning President Donald Trump’s reaction to the murder of Jamal Khashoggi. “President Trump’s response to the brutal murder of journalist Jamal Khashoggi is a betrayal of long-established American values of respect for human rights and the expectation of trust and honesty in our strategic relationships. He is placing personal relationships and commercial interests above American interests in his desire to continue to do business as usual with the Crown Prince of Saudi Arabia. 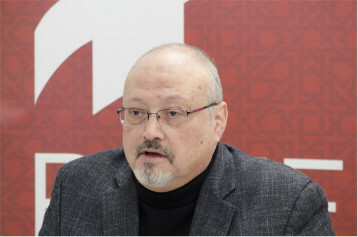 The Central Intelligence Agency has thoroughly investigated the murder of this innocent journalist and concluded with high confidence that it was directed by the Crown Prince. If there is reason to doubt the findings of the CIA, President Trump should immediately make that evidence public. President Trump is correct in saying the world is a very dangerous place. His surrender to this state-ordered murder will only make it more so. An innocent man, brutally slain, deserves better, as does the cause of truth and justice and human rights.